I sure am glad you didn't use his other catch phrase. While watching episodes of "Kojak", I was struck by how ugly the suits were that were worn by the cops and the perps. They also wore some weird hair styles. Joe Friday and his partner on "Dragnet" showed a better sense of style, in my opinion. Ah yes, the early 50's when MEN still wore hats. Don't know if everyone knows the story about the lolly pop. Basically, Telli was a chain smoker at the time, and he had to put the lolly pop in his mouth to get through filming each scene. I was hoping somebody else would chime in & say it--but Kojak would occasionally say "Everybody should have a little Greek in them." 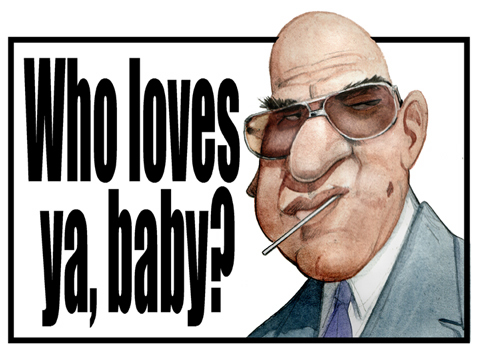 That show came out when I was just a lad, but I could almost swear that I remember seeing Kojak smoking. This page contains a single entry from the blog posted on September 18, 2011 8:07 PM. The previous post in this blog was Illustration Friday Entry: MESMERIZING.